--To not care that Gwen and that country dude are dating. --To think it's ridiculous that some people are getting worked up over Starbucks cups. --To have no desire to see the new 007 movie. --To still wonder if Glenn on The Walking Dead is dead or not. --To appreciate all the comments I received for my Tell Your Kid To Stop Telling My Kid That Her Booster Seat Is For Babies post. 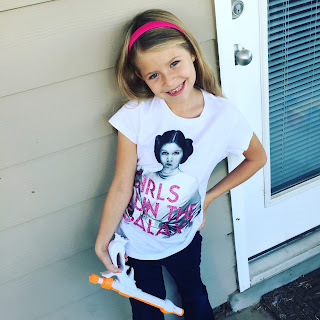 --To love this Star Wars shirt that I found at Target. I don't care who she dates, but ugh as to Gwen these days! I turned on the Voice last night and was like "is that Heidi Montag??" Omg, thank you about the damn red cups. I hope those kids leave Natalie alone. But you can tell her I said that kids teased Steve Rogers and he grew up to be Captain America. Just saying. starbucks sells christmas blend coffee. there. now shut up crazy people. hehe. what worries me more are the lemmings who don't take the time to research something and see if the claim is legit or not. Check this out: http://on.fb.me/1SFNBvb LOL! No answers about Glenn yet?? Not cool. The Starbucks cups thing is so absurd that I can't even read about it. I did see a friend mention that they didn't say "Christmas" last year either! I didn't fact check, though. I also heard that Donald Trump is mad about it too. Makes me dislike him even more, if possible. I am not a Starbucks drinker but the hubbabaloo over the cups is kinda ridiculous. I wonder if the whole Glenn thing will be a dream or hallucination. I've decided the Starbucks/red cup guy was a plant by Starbucks to get even more business. Like they need it. I want that Star Wars shirt and I'm not even a big Star Wars fan. I don't care that Gwyneth Paltrow started a publishing company. I saw that on the news today and was like, "WHO CARES?" The Starbucks cup controversy is INSANE. I cannot believe people are so angry over a RED CUP! Umm.. put some Christmas blend in your cup and be on your merry way. Love the Star Wars shirt. I need that in adult size. The Starbucks thing is beyond weird. I just can't even believe its an issue.